Amsterdam is an easy weekend trip from London, and a city I’ve fallen in love with. It’s often associated with the red light district or the opportunity to legally try marijuana, but it’s just so much more than that. From the beautiful canals lined with restaurants and cafes, to the rich-cultural experiences and historical homes, there’s something for everyone in Amsterdam. We looked for a long time for the perfect accommodation; everything in central Amsterdam is very expensive, and we knew we wouldn’t spend a lot of time in our accommodation. When we stumbled across the Jaz in the City Hotel, it was love at first booking. They very kindly hosted Joe and I for two nights, and here’s my honest review of the Jaz Hotel in Amsterdam. From the moment we walked in, we were met with smiling faces and transported into a world of music. All of the interior at the Jaz Hotel has been designed with music and rhythm in mind, so you’ll often see lyrics, instruments or portraits of famous musicians lining the walls. The theme colour is neon orange and purple, and they’ve somehow managed to make this bright colour scheme work, and have some seriously cool décor. 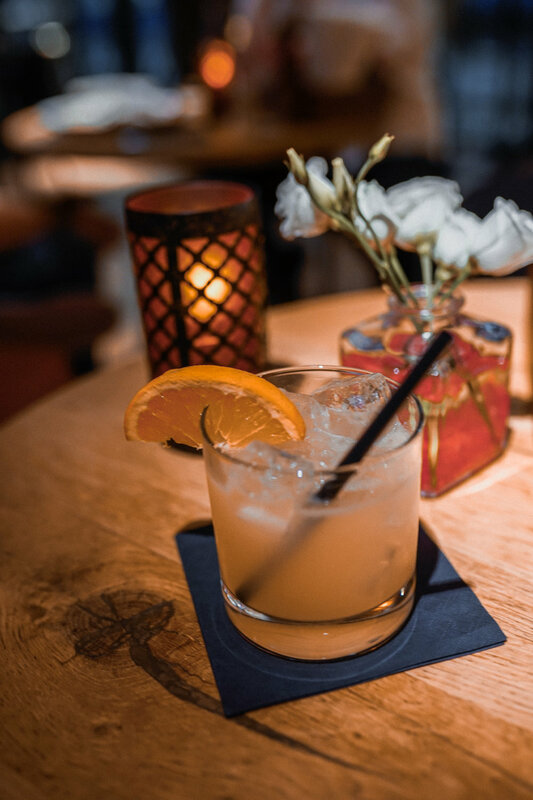 Every detail has been thought of throughout the hotel – there are guitars hung on walls, a DJ in the rhythm restaurant at night time and speakers in every room. The Jaz Hotel wants people to find their own rhythm, and if you can’t find it here… you won’t ever find it! We were very lucky to stay in the VIP Suite, which included a king size bed, private balcony, deep bathtub and much more. We were blown away by how modern, fun and in-theme the entire suite was. CDs lined one of the walls, while there was an electric guitar hoisted on the bathroom rooftop. The frosted glass in the shower was lined with an old pirate’s tale, while the neon orange bath (big enough for two!) was backlit and featured a TV built into the wall. The double basin sink featured a Hollywood-style lit dresser, and matching neon orange basins. 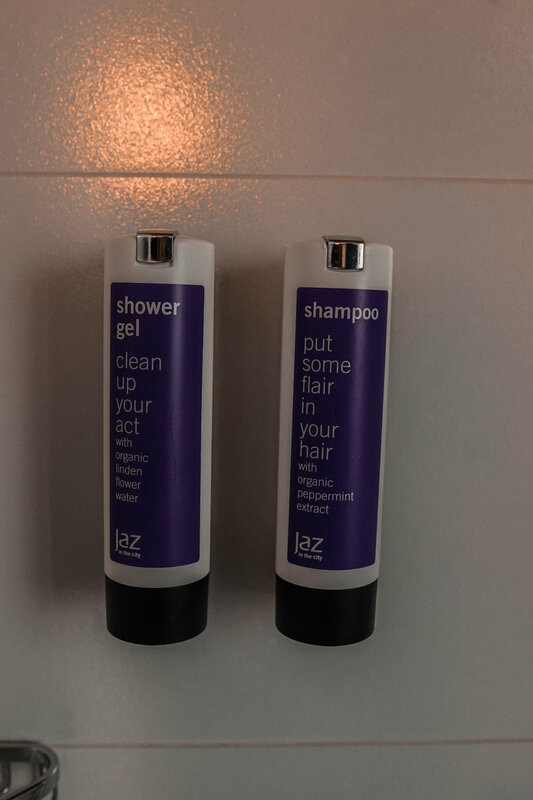 All of the toiletries were the Jaz Hotel’s own branding, and they were fabulous, natural products that left us smelling and feeling great. Funnily enough, it was the toilet that left the biggest impression on us. It was completely electronic, and as you opened the door to the toilet, the toilet seat automatically opened. It was a “self-cleaning” fit-out, which means you basically just do your business, and then the toilet washes and dries you. It sounds totally crazy (it really is) but OH MY LORD, if I ever win the lotto I’ll be buying a cleaning toilet for every bathroom. The room was absolutely gorgeous, and we spent more time in their than we’d anticipated because we genuinely enjoyed it so much. It was very romantic, and also just young, fun and modern. We pumped the tunes, connected our phones easily to the TV and spent a night in. We headed down to the Jaz Hotel’s restaurant, Rhythm for dinner where the local DJ Vitra was playing. Joe had the ribs (bigger than his head!) and I had the steak, and both were cooked to perfection. We had a few cocktails that were so delicious, and really enjoyed the ambiance of the restaurant. There are so many places to eat in Amsterdam, but it’s so convenient when your hotel restaurant is just as good (if not better) than other places. The Jaz Hotel is located next door to the stadium, where many famous celebrities have performed, as well as big football matches. I can imagine it must be crazy convenient to stay here during a concert, but regardless I’d say it was in a great location. The Jaz Hotel is really close to the Strandvliet station (4 minute walk), and takes you to directly into central Amsterdam. It’s a 15 minute train ride exactly, and not long at all. It was great to stay a little out of central, as it meant we got to explore different neighbourhoods and experience the public transport system. The Jaz Hotel is very affordable, and I really cannot recommend it enough. You can find out more about it HERE.